Turn your supporters into passionate ambassadors for your cause. Charitable Ambassadors brings the power of peer-to-peer fundraising to WordPress. Peer-to-peer fundraising (also known as social fundraising) gives your supporters a way of doing much more than just making a donation. They can create fundraising campaigns, spreading awareness of your organisation through their network of family and friends. Unlike other peer-to-peer fundraising software, Charitable Ambassadors does not charge any transaction fees. With Charitable Ambassadors, you can use peer-to-peer fundraising to leverage your supporters’ network of friends and family. Ambassadors adds a frontend campaign submission form, so people can create fundraisers for your cause or personal causes, allowing you to create a crowdfunding platform. Other fundraising software charges you for every donation you receive. Charitable is different – we won’t charge you any transaction fees. PayPal and offline donations are supported out of the box. When you’re ready to start accepting donations through a different payment gateway, you can choose one of our premium gateway extensions. We believe that good fundraising software should be affordable for organisations of all sizes. That’s why there are no transaction fees, setup costs or monthly charges when you use Charitable. It’s also why we decided to make our Charitable Pro package available on a Pay What You Want basis. How much is it worth? We have seen others charge as much as $500 a month for similar features. We suggest $249 for the Bundle. Every new extension we create in the year after you purchase. The minimum price is just $194. With Charitable Ambassadors, you can give your supporters a platform to put together an amazing fundraiser for your organisation. Charitable Ambassadors allows you to create a public campaign submission form, using a simple shortcode. The front end submission form added with shortcode. 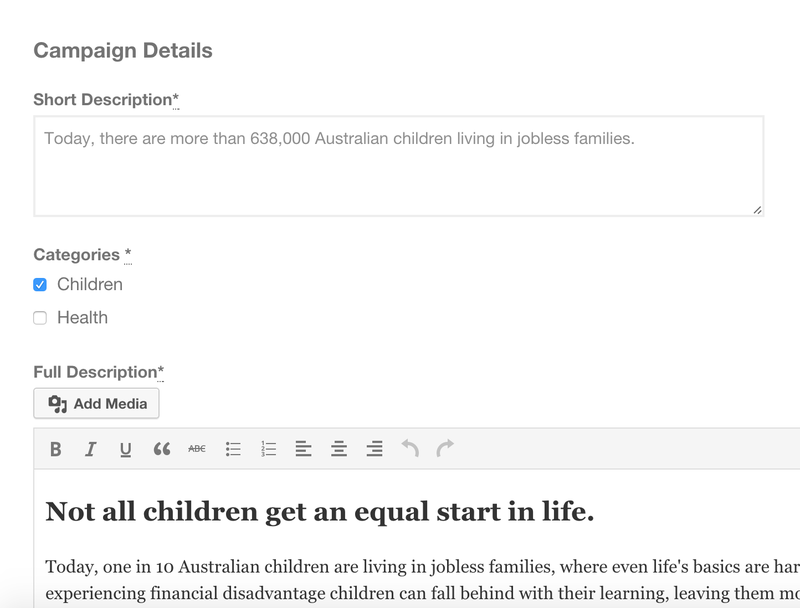 You can also create a separate page that allows campaign creators to see the campaigns they have created. After your Ambassador has added a campaign, they can keep track of their fundraising efforts with this page. Campaign creators can track the campaigns they have created. Charitable Ambassadors lets you choose whether people can create fundraisers for personal causes. When the Ambassador creates a campaign for a personal cause, they add their PayPal address, allowing you to send them any money their campaign raises. With Ambassadors, you can let your fundraisers raise money for their own personal cause. We would love to chat with you to see if Charitable Ambassadors is a good fit for your needs.